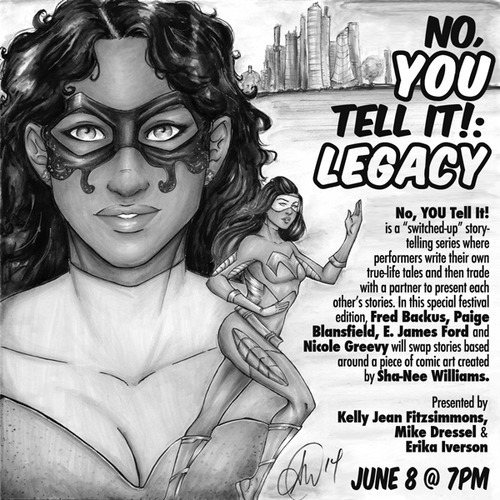 Meet Our Legacy Storytellers | No, YOU Tell It! Fred Backus is a theater artist and musician in New York City. He’s thrilled to be asked to return for another installment of No, You Tell It!, where he previously appeared in URBAN DWELLERS. He’ll be directing Maggie Cino’s Warm Enough For Swimming this August at the New York International Fringe Festival, and you can catch his band Deacon Bishop Revival when they play out around town, or by visiting www.deaconbishoprevival.com. Paige Blansfield is a CSR professional by day and a director/choreographer by night. Recent credits include directing Gathering the Magic with Nelson Lugo and Brainexplode! and Rock, Paper, Scissors with Sneaky Snake Productions. In her previous adventures as a Casting Associate at Tara Rubin Casting, she helped cast productions of Jersey Boys, Billy Elliot, The Country Girl, The Farnsworth Invention, Rock ‘n’ Roll, and Promises, Promises, among others. E. James Ford is an actor who can be seen every week performing in the immersive theatre experience Speakeasy Dollhouse and its companion piece The Brothers Booth. He recently appeared as Blaz Anton in the rock musical BitchTwitch: The Kidnapping of Vicki Presh and can be seen as Adlai DiLeo in the sci-fi series Pioneer One. Later this year, he will appear in Futurists with title:point productions, The Dreary Coast directed by Jeff Stark, and the feature film Revolver starring Burlesque superstar Veronica Varlow.